Al Ewing is the miracle worker of Marvel Comics. He does remarkable work evolving characters and concepts while staying true to the past, and books like Loki: Agent of Asgard, last year’s Rocket miniseries, and his Avengers spin-offs showcase his versatility, ambition, and enthusiasm for superhero stories. After Secret Wars, he was one of the few writers to pick up the threads of Jonathan Hickman’s expansive work on the Marvel Universe, and when he took over the Inhumans, Ewing leaned into the cosmic mythology that Hickman had developed with these characters during his Fantastic Four run. Ewing went big with Royals, and it was a refreshing change of pace after years of Marvel trying to ground the Inhumans and fold them into human society. 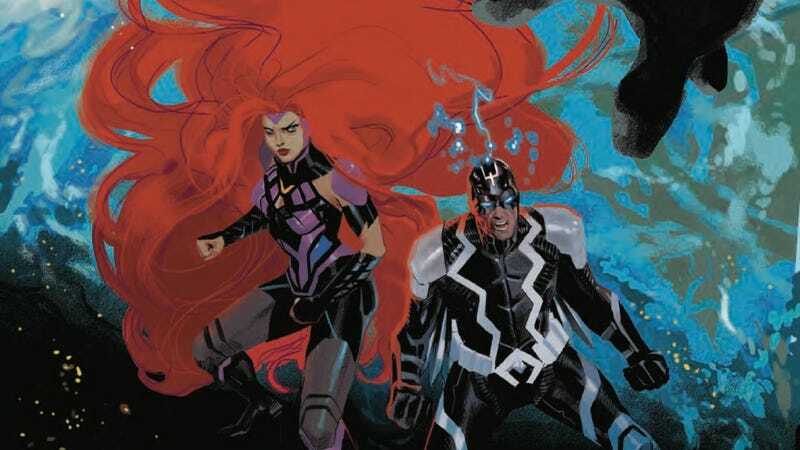 Royals had a rocky start as it made its way off Earth, but the book clicked into place once Ewing incorporated the Universal Inhumans (created by Hickman), established a new larger-than-life threat, and gained a consistent art team that matched the tone of his story. Characters changed in major ways, tender new relationships were formed, and the series got a huge influx of cool as Ewing and his collaborators put the Inhuman royal family through spectacular trials. Unfortunately, Royals was cancelled after 12 issues, but the story wraps up in next week’s Inhumans: Judgment Day one-shot. This exclusive preview catches readers up on what went down in those previous issues, and it does so with explosive visuals that energize the exposition. This preview starts quietly as the creative team eases readers back into the story, but then it gets very loud once Maximus starts recounting the royal family’s journey. Artist Kevin Libranda and colorist José Villarubia have been working with Ewing since Royals #6, matching the mix of sci-fi spectacle and character introspection in the scripts. They’re splitting art duties with Mike Del Mundo on Judgment Day, and this excerpt reveals how Ewing’s writing adapts to multiple artists. Del Mundo is one of the most thrilling artists in superhero comics, both for his innovative cover illustrations and his dynamic sequentials, and the splash pages in this excerpt combine both of those elements as they create grandiose images that also break down multiple plot points. There’s a beautiful symmetry in these two pages, and Del Mundo’s storytelling is full of both force and grace. Ewing who knows how to write to his artists’ strengths, and if Marvel is planning on keeping the Inhumans in the spotlight after Judgment Day, it should seriously consider Ewing and Del Mundo as the ongoing team.